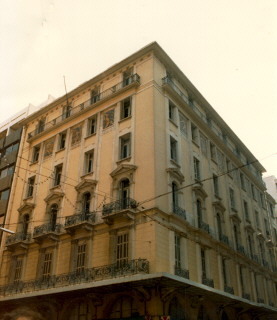 It was built in 1920 by V. Kouremenos. It is a six-storied building of an eclectic style with distinguished separate morphologic and architectural elements that compose the concept of the work of art (symmetric openings, marble galleries with well-worked lattices of cast-iron, false frames running all through the facets, depictions in mosaics between the openings of the fifth floor). By a ministerial decree of 1988, the building was identified as a work of art. Today, it houses shops and offices.